We always keep a first aid kit in our car - it has been very useful during numerous day trips and staycations and it gives me piece of mind to know it is there should I ever need it. I thought I would share with you the contents of our kit (which we keep in the boot of our car). Please note I am not a medical professional - this is just the kit that has worked for us. 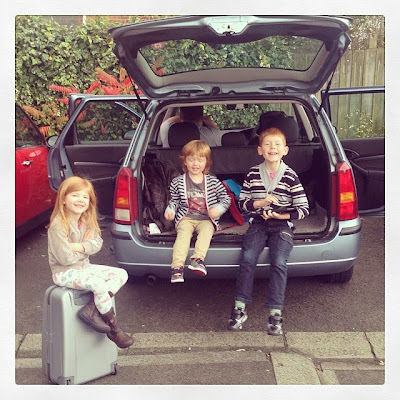 Car travel with children seems to induce a headache in both myself and my husband. Therefore a supply of paracetamol/ibuprofen for us is a must. Equally, age-appropriate child pain relief is handy should your children need it during their journey or trip. We find the individual sachets are much easier to transport than bottles. Just make sure you check the use by dates regularly. A good travel first aid kit is a must. We like this one from Brosch Direct. 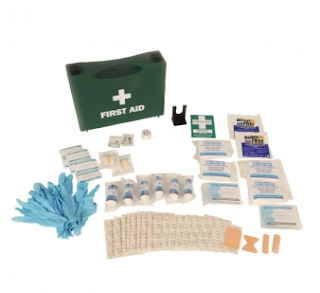 At only £9.95 it has been designed with travel in mind and contains all of the essentials you might need from bandages and plasters to foil blankets and resuscitation shields. Make sure you check your stock regularly and top up when needed. The British weather is so un-predictable at times. It can be pouring down with rain when you leave home and by the time you reach your destination the sun can be shining brightly! It is important not to get caught out and always have sunscreen at hand. I like Aldi's Lacura Suncare moisturising suncare lotion which is less than £5 per bottle and last year passed Which's UVA and SPF tests. Motion sickness can occur at anytime but is more common during a woman's period and pregnancy. This article from NHS Choices is full of helpful advice. We have found that packing water to drink regularly, opening the window and ginger supplements work for us. Finally, I cannot stress the importance of knowing some basic first aid and knowing what to do in the event of an accident. It is always worth enrolling on a first aid course and refreshing your knowledge regularly. The St John's Ambulance and British Red Cross run regular training sessions. Have I missed anything out? What are your family travel first aid essentials?